We declare Musicloud to be a malicious program that falls into the category of adware. We suggest removing this program, because it might seem that its only purpose is to promote a website called Musicloud.io, but it is not. Our research has found that its most malicious functions are to display advertisements and secretly download more adware on your computer. On top of that we found that it cannot be uninstalled via the Control Panel. Therefore, we took it upon ourselves to investigate this program and provide the Internet community with the most up-to-date information about it. We invite you to read this short article if you want to know more, and follow the removal instructions supplied below if you want to get rid of it for good. Musicloud’s developers have turned to the most effective distribution method there is to get as much computers infected with it as possible. Software bundles are very good distribution vehicles. The distributors bundle one legitimate program that acts as bait and several other malicious programs that are hidden from plain sight. If you download free software from freeware distributing websites, then you should always check to make sure that you will not get unwanted additional software by opting for advanced installation settings. To our knowledge, this program is not distributed anywhere else. The website that this program promotes is called Musicloud.io, which is a music streaming website that allows you to listen to your favorite tracks free of charge, create playlists, get lyrics, and so on. It has a wide selection of music. The website also seems to be integrated with iTunes and Amazon.com, since it can redirect you to each of these websites after you click a track’s download button. The overall experience of using this website is satisfactory with only a few minor issues. But let us get back to the adware program. If you happen to get Musicloud then it will create a desktop shortcut to Musicloud.io, which is nothing to complain about. However, it can start displaying third-party advertisements that are in ample supply. The ads may be intrusive and they come in various shapes and forms, mainly coupons, banners, and pop-unders. This program has two background processes that launch automatically once you boot up your computer. 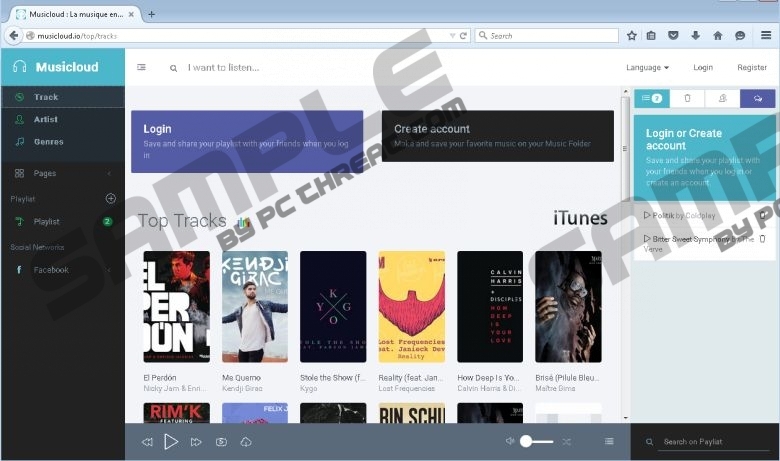 We have a hunch that one of these processes might be used to covertly download and install additional adware programs, which spells big trouble as more adware can drastically slow down your computer and some of it might be quite hard to root out, hence Musicloud. If you have got Musicloud on your computer and you are looking for ways to delete it, then you have come to the right website. We have found a way to remove this undesirable and malicious program from your computer for good. It works on all Windows operating systems. However, it has one randomly named folder that might be tricky to find, but we hope that you will manage it. So we invite you to make use of our removal guide. Type C:\Users\user\AppData\Roaming\ in the address bar and press Enter. Find folder named Musicloud and the randomly named folder. Right-click on them and click Delete. Quick & tested solution for Musicloud removal.